A developer has proposed constructing restaurants, cabins, campgrounds, a marina and other facilities and buildings on public land on an undeveloped peninsula at Raystown Lake. Sadly, for Raystown's public land and for the Hawn's Bridge Peninsula Natural Heritage Area, the proposed development is EVEN WORSE than what we had imagined. We're sponsoring a petition to protect the Hawn's Bridge Peninsula Natural Heritage Area along Raystown Lake in Huntingdon County. "DISTURBANCES THAT CAN LEAD TO THE INTRODUCTION OF EXOTIC AND AGGRESSIVE SPECIES ARE ONE OF THE LARGEST THREATS"
A developer has proposed constructing restaurants, cabins, campgrounds, a marina and other facilities and buildings on public land on an undeveloped peninsula at Raystown Lake. Sadly, for Raystown's public land and for the Hawn's Bridge Peninsula Natural Heritage Area, the proposed development is EVEN WORSE than what we had imagined. Public lands ranging from the top of Terrace Mountain to the tip of the Hawn's Bridge Peninsula in Raystown Lake would be impacted severely by the proposed construction of restaurants, cabins, campgrounds, a marina, and associated buildings. This land is owned by the U.S. Army Corps of Engineers and is now in its natural state. The Hawn's Bridge Peninsula is of such high ecological significance that it is designated as a Huntingdon County Natural Heritage Area "of exceptional value". The Hawn's Bridge Peninsula is part of the Raystown Dam Natural Heritage Area (Biological Diversity Area) identified in the Huntingdon County Natural Heritage Inventory [PDF]. The Inventory identifies such areas as "containing plants or animals of special concern at state or federal levels, exemplary natural communities, or exceptional native diversity." The area in which a marina and other facilities are proposed includes red cedar-mixed hardwood rich shale woodland and Virginia pine-mixed hardwood shale woodland communities. These rare habitats support two plant species endemic to shale barrens: the shale barrens evening primrose (Oenothera argillocola) (PA Threatened) and Kate's mountain clover (Trifolium virginicum) (PA Endangered). Several invertebrate species associated with shale barrens and the surrounding xeric forest also are found there. These include the southern pine looper moth (Caripeta aretaria), the promiscuous angle (Semiothisa promisuata), and a noctuid moth (Properigea sp.). 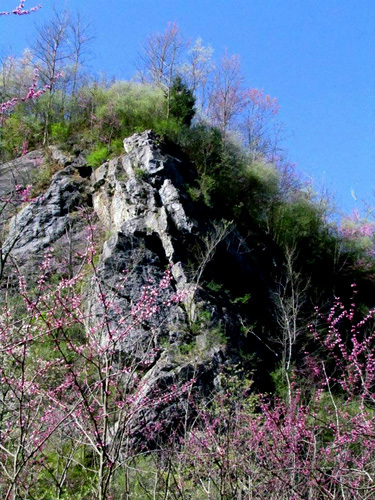 According to the Huntingdon County Natural Heritage Inventory (p. 148), "The shale barren communities and associated plant species depend upon the harsh conditions found on these steep, dry slopes where competition from other species is low. Disturbances that can lead to the introduction of exotic and aggressive species are one of the largest threats." The establishment of campgrounds, cabins, restaurants, and a marina and associated facilities on the Hawn's Bridge Peninsula would certainly cause the types of disturbances which the Inventory warns against. Please also sign the JVAS Petition to protect the Hawn’s Bridge Peninsula. An unsigned editorial from the Pittsburgh Post-Gazette spells out the fundamental wrongness of PA House Bill 1576. When it comes to protecting endangered species, whom would you trust? Members of the Legislature, who know squat about conservation but a lot about campaign contributions from special interests, or the wildlife experts employed by state agencies that manage threatened and endangered plants and animals? If you trust ideologically driven politicians more than the professionals, then House Bill 1576 is for you. The measure, which has 67 cosponsors, treats current regulations and the species they protect as a nuisance to economic progress. Anti-conservation lawmakers are taking aim at Pennsylvania's endangered and threatened species. Pennsylvania HB 1576 and SB 1047 would diminish the Pennsylvania Game Commission's and Pennsylvania Fish and Boat Commission's ability to protect endangered and threatened species in our state. Anti-conservation lawmakers are taking aim at Pennsylvania's endangered and threatened species. Pennsylvania HB 1576 and SB 1047 would diminish the Pennsylvania Game Commission's and Pennsylvania Fish and Boat Commission's ability to protect endangered and threatened species in our state. The commonwealth has a long and proud tradition of independent fish and game agencies. Politicians shouldn't mess with it. These bills would send the Commission's endangered and threatened species lists to the Independent Regulatory Review Commission (IRRC), an agency dominated by the legislature, for additional scrutiny. The IRRC does not have scientific expertise or standards to evaluate species listing proposals. Proponents of the bill claim that this is just like asking for a second opinion on a medical diagnosis. That claim is absurd. Second opinions on a diagnosis are rendered by another physician, not by political appointees with no science background. These agencies' biologists are better judges of the threats to wildlife than political appointees would be. The agencies make decisions regarding proposals for protecting rare, threatened, or endangered species in an open, transparent manner. As if we needed more reasons to oppose these bills, their passage would likely mean the loss in up to $27 million in federal wildlife restoration funds, representing up to a third of the budgets of the Game Commission and the Fish and Boat Commission. These federal funds would be lost because managing threatened and endangered species in the fashion proposed by this bill would demonstrate our state's incompetence in wildlife management. In addition, these bills could encourage more federal involvement in species protection. One of the criteria utilized by the U.S. Fish & Wildlife Service in determining whether to pursue listing of a species is the sufficiency of state resource protection laws. By curtailing the authority of the Commissions, this proposed legislation could prompt a more active federal role in species protection. Juniata Valley Audubon asks that conservationists oppose Pennsylvania HB 1576 and SB 1047.